Men have endured a long and complicated relationship with their beards since they learned to walk on two feet. In their early days, beards served a practical purpose by keeping warm and offering protection from disease. In the following guide, we will explore in detail how to grow and trim a beard. There’s also a little bit of history on the beard and we’ll present the different beard styles that you can discover in full. Why Does Your Beard Itch? As time went by, the beard became a symbol of status and power. However, the Romans were fervent advocates of a clean shaven face. It was their belief that long beards were associated to uncultured barbarians. Roman men considered personal grooming to be a hallmark of a sophisticated civilisation and the Tonstrina or barbershop blossomed to life. Conversely, the Gauls believed that long, braided hair and beards indicated status and good health. 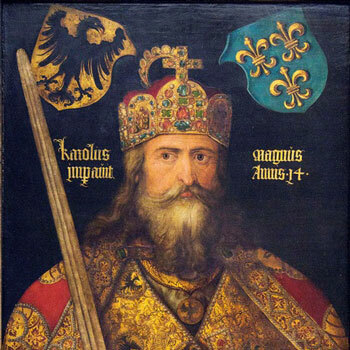 Frank kings such as Charlemagne would famously grow impressive and wavy beards, which were typically associated with power. Merovingian kings would prefer death before a cut beard, which indicated the loss of their claim to the throne. With the Renaissance, beards had a short-lived comeback in England that soon waned when wigs from France came into fashion. Beards then returned as wigs all but disappeared and saw a boom in the second half of the 19th Century. Beards have phased in and out of fashion. 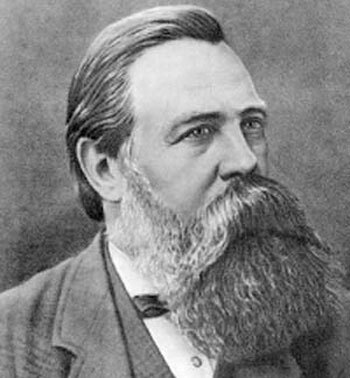 Some experts believe that beards become more common during times of economical hardship as a subconscious survival mechanism. Others argue that beards become fashionable when the population of women drops causing men to compete for dominance amongst themselves. Today, around 33% of American men have some kind of facial hair as opposed to 55% of men around the world. Beards will always be with us in a plethora of styles. However, for many men, a beard is not just a fashion statement but an entire way of life. Whether fashionable or not, the secret is always looking your best with the beard that’s right for you. Below is a selection of beard families that we cover extensively as well as their variants. You will find detailed guides on how to grow, style and trim each type according to your face shape. Feel free to jump right in and click on one to read more. Alternatively, scroll down first to learn how to grow a beard, trim it and properly care for it. The secrets to growing any beard are patience and resolve. When a man decides to grow a beard, they are often disappointed that they don’t achieve the results they want in a short space of time. That is not to suggest that most men expect results overnight. However, we tend to underestimate the time it requires to get to a certain length. Growing any style of beard is a commitment in one form or another. 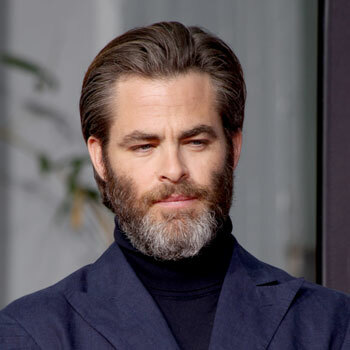 The most popular styles are usually long, Full beards, which are ambitious goals that require considerable time to grow. When we make the commitment, we are usually aware that it takes time. Nevertheless, after a few weeks or even months, we can get disheartened that there is still much progress to make. To overcome this, the commitment to grow a beard should be made in stages. Set targets that involve intermediate styles whilst keeping a final objective. For example, a man may want to obtain his dream beard, which is a Full Bandholz. Something like this could take as much as a year to grow and properly style. There is nothing more frustrating than staring back at a messy; unfinished beard in the mirror. To ensure that the growing experience and exploring your masculinity is enjoyable, consider adding goals in between. This can start with partial beards such as a Balbo. This fills out with Stubble and can transition into a shorter Full style such as the Garibaldi. Whilst keeping it neat, it can still be grown out into something more impressive before arriving at the final target. Growth varies from person to person. Some may be lucky enough to grow as much as 0.05 inches (1 mm) per day. However, the average man will grow approximately half an inch (1.25 cm) per month. Although genetics plays a significant role in hair growth speed, lifestyle factors can also have an effect. These vary from the usual suspects such as a balanced diet, regular exercise and healthy sleep patterns. They may not have an enormous impact on the rate which your hair grows. 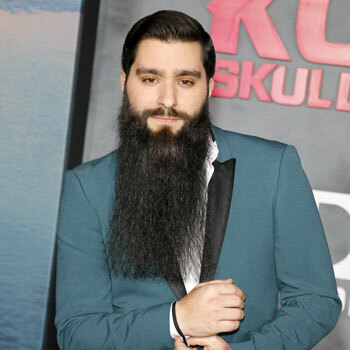 However, if you are seriously committing to a long beard, it might be worth taking into consideration. Any hair growth including beards occurs in three cycles known as the anagen, catagen, and the telogen. The anagen is the growing phase that last between 2-7 years. This is then triggered to enter the catagen, which is a short transition that ends active growth. Over a period of 2-3 weeks, hair transitions to the telogen. The hair becomes dormant over the course of 3 months before shedding to allow for the growth of new hair. Bear in mind that none of this is synchronised. All hair follicles are in different stages of growth at any given time. Normally up to 90% are in the anagen phase, while 10–14% are telogen and 1–2% are catagen. An average person sheds 50 to 100 hairs a day from their scalp. Why is this important? Firstly, knowing this helps understand that each of us have limitation in how long we can grow our beards. Nevertheless, even if your anagen lasts only two years, that leaves you with around 1 foot (30 cm) of growth, which is ample for any man. Secondly, it helps understand why some men experience patchy hair when Stubble grows back after shaving. Thirdly, it is comforting to know that shedding hair is a natural process and doesn’t necessarily indicate hair loss! Typically, beard growth is summed up into two broad phases: 4 weeks and 4 months. These are often employed to imply what stage a man is going through when growing it out. Both are vastly different experiences as we will explain in full. The first few weeks are a daunting experience even for the most hardened beard veteran. At first, the Stubble looks pretty tough but feels like low grit sandpaper. The grated texture can be pretty fetching and even hardens your features along the jawline. Two weeks in, the once handsome Stubble becomes unruly grows in all directions, sometimes poking out in the most unexpected areas. Some men will begin to cross into an itchy period at this point. The irritation can be soothed with moisturiser or even the early use of beard oils. As it transitions into a beard, the itchiness will subside but it may appear scruffy. 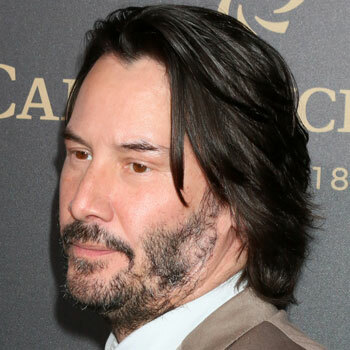 Many men may feel an overwhelming urge to just shave it all off an be done with it at this point. This is the first test of resolve. At 4 weeks, the growth will begin to feel like a beard. Yet it’s unlikely that it will be a pretty sight. If aiming for something short and tamed like a Boxed or Circle beard, it can now be styled. 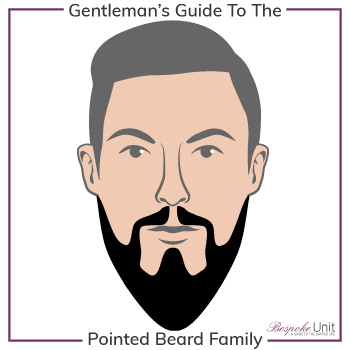 However, if the goal is a Full beard, be satisfied with cleaning the cheek and necklines as outlined below. You may also begin to notice the patchy areas have filled out. Both the catagen and talogen take 4 months in total to cycle back to the anagen. So although the majority of hair growth will be present, some may still yet fill out. That said, you will be far enough in to more-or-less assess your growth’s limitations and decide on a fitting style. You’ve made it this far and now on your way to growing a solid beard. Once between 2 to 3 months of growth, you will be able to begin styling it by sculpting its form. Scissors provide more control whilst trimmers offer convenience. Concentrate mostly on how the beard appears at the front and then to the sides. If the beard is to continue growing, the view from the bottom requires little attention. Genetics are unfortunately a barrier to some who wish to grow a Full beard. They may encounter patchy hair growth with bare areas that reveal skin on the cheeks. Sadly, there are no secret potions that can change this and there is little evidence to support hormonal supplements. Use what you have to your advantage. There are a number of alternative beard styles that can be adopted to enjoy the privileges if beardom. Nevertheless, unless settling at an intermediate length, try to avoid overly styling until after 4 months. It may sound obvious but too much styling will slow down overall growth. Furthermore, you will want a uniform beard once at 4 months. This will let you style it exactly how you want it and not have to wait even longer because you tapered a section too short. Most men have experienced an itchy beard on at least several occasions. The experience is infuriating. Even a slight gust of wind feels like its chafing away at your cheeks. You’ll find yourself clawing at your face and especially around your jaw. The reason we experience this is because shaving slices the follicles at an angle. As the hair grows back out the skin, the points are often sharpened with needle-pointed and jagged edges. At first, the Stubble stands upright so we don’t feel anything. Our loved ones, however, certainly do when we come in for a kiss. After a certain length, the hair begins to fall back and curl in on itself. It’s at this moment that we really begin to experience the itchiness. However, unnoticed irritation starts shortly beforehand. The skin underneath, unaccustomed to a coat of hair and used to regular shaving, struggles to hydrate itself. Unable to receive the necessary moisture, it builds up with grease, which then dries out when washed. To compensate, the skin requires a helping hand to overcome the sharp bristles that literally rub salt into the wound. A combination of regular cleaning and hydrating help the skin recover and eventually find balance. A thorough clean and exfoliation clean out the pores when washing. The skin should be nourished and protected afterwards with moisturiser during early stubble. 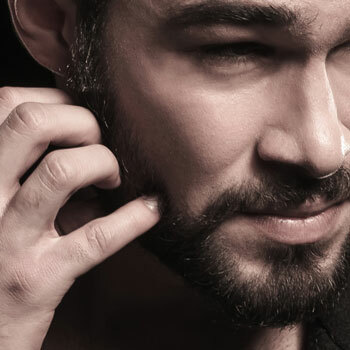 As the Stubble gets longer, you can continue moisturising with cream or introduce a beard oil into the mix. Not only does this hydrate the skin, but it nourishes and softens the hair, soothing any itchiness it creates. Before we explain the correct methodology for trimming a beard, we need to discuss the importance of caring for it. Like head hair, dry beards are much more difficult to manage and become wiry. A badly nourished beard will render the task of pruning a challenging endeavour. By taking a few simple steps beforehand, trimming becomes a breeze. At 4 weeks and beyond, a few toiletries such as beard oils and a brush become essential. The oils will nourish the follicles and keep them healthy. Brushes specifically for beards have softer and denser bristles, which make them more efficient. Furthermore, the face’s skin is more sensitive than the scalp so a beard brush will be soothing rather than irritating. You’ll read a bit about beard accessories below. However, if you’re looking at getting seriously kitted up, head to our dedicated series on beard care accessories. Each beard style has its own quirks when it comes to to pruning, which we cover on their respective pages. However, all require a common approach for general trimming. Every man should own the following essential tools and accessories. These are invaluable if they wish to properly trim, style and maintain their beard. Trimming should always be undertaken on a clean and prepared beard. Firstly, a clean beard won’t get your accessories dirty. Furthermore, a good clean is important for it and will soften the hairs to make trimming easier. Facial hair is much like the hair on your head and needs to be treated accordingly. Therefore, unless you have fine hair, an oily scalp, or live in a humid area, you don’t need to shampoo daily. The hair roots produces a natural oil called sebum that nourish and protects the hair. It’s a by-product that makes hair shine and creates volume so needs to be preserved when possible. Shampoo works by trapping oils. Therefore, if you use it too frequently, the result leaves you with a very dry beard, which breaks and tangles. Men with short beards can get away with daily shampooing because the follicles need less time to be replenished it with oils. However, men with long beards need to find that balance, which is often no more than three or four times a week. Arguably, you could wait until each time you trim your beard. Whilst shampoo cleans hair by essentially stripping it of oils, conditioner replenishes it. Again, this is something that may cause men to turn their nose up but conditioner is absolutely vital if you want to keep your beard looking healthy. There are also a number of beard shampoos on the market, which we highly recommend as an alternative to regular shampoo. This is because shampoo for hair tends to feature harsher compositions of toxic chemicals that can damage your beard. Head to our dedicated guide to read about beard shampoo and conditioners. Don’t mercilessly attack your beard with a towel or hair dryer. Instead, pad it dry until smooth and slightly humid rather than dripping. You want it to be manageable yet still clearly see how it will look when dry. Brush or comb your beard everywhere first against the grain then with it. This will get rid of any straying tangles and settle them correctly in one direction. Whilst beard brushes are great for any length of hair, men with longer beards may want to consider using a comb for deeper growth penetration. If you have neither and are still mulling over which one to buy, you can peruse our beard brush guide as well as the beard comb page. If you’re still growing out your beard, you can skip this step. Use scissors instead to clip away any stray hairs. When trimming, always start with a a bigger guard or lower setting than you actually want. This will avoid any accidents in removing too much. Trim vertically going downwards to avoir hair rising up and taking chunks out of your beard. Take hair off in increments on each side to ensure symmetry and brush back into place every now and then to make sure everything is in order. Sculpt your beard into the style you want with the trimmers. You’ll find specific guides for shaping each style on their respective pages listed above. However, if you don’t yet have any clippers, we suggest that you read our beard trimmers guide to find the right ones for you. There are several ways to define a neckline. Furthermore, not everyone has truly defined boundary between their face and neck. The easiest, quickest solution is by looking in the mirror. Tilt your head up so you can see you neck. Visualise a U shape that goes from ear to ear with its lowest point just above the Adam’s apple. Similarly, draw the line with your finger across your throat as if you were making a death threat. This is quick and dirty way to see what needs to be removed underneath. A precise method for defining the edges is from the side. Imagine two axes X and Y as illustrated in the graphic below. Axis Y is a straight line down that follows the back of Sideburns. Axis X seems complicated but it’s simply the aforementioned U-shape that travels from ear to ear seen from the side. Once properly visualised or drawn out using a razor’s edge whilst shaving, you can round off the contour for a smooth finish. Now simply remove any stray hairs outside this area. Stretch out the skin to make this easier. Consider also that the neckline can be stylised. Once the contour is established, you can use clippers on shorter styles to create a fade. This is achieved by decreasing the guard number from the jawline and towards the Adam’s apple after a first pass. Alternatively, gradually add pressure when trimming towards the Adam’s apple. 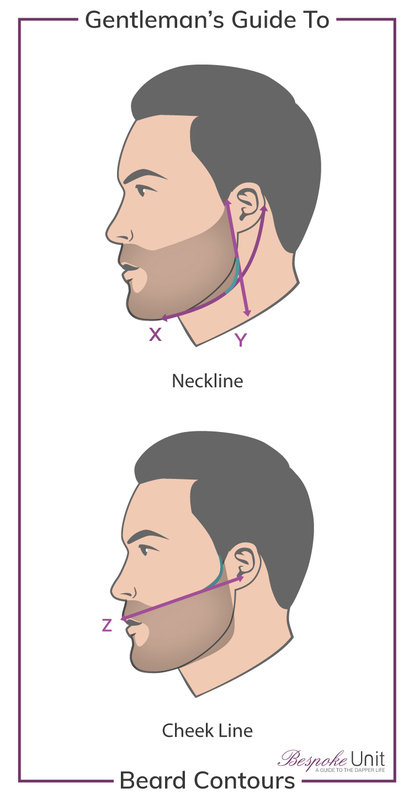 Bear in mind that some beard styles have necklines that side far higher using the jawline as a reference. You can read more about this in the Boxed beard style guide. The cheek lines are a simpler affair as it doesn’t require any awkward posturing. Study the natural growth on your cheek after letting it out. You’ll notice that the hair often grows pretty high and doesn’t look particularly attractive. You can rein this contour in and neaten it according to its natural growth. Alternatively, some stylised beards have low-sitting cheek lines. Nevertheless, understanding your natural morphology will help make stylising to your face shape easier. To identify your cheek line, simply visualise a straight line that goes from your ear hole to where your moustache naturally falls and meets the cheek hair. See axis Z in the graphic below for reference. 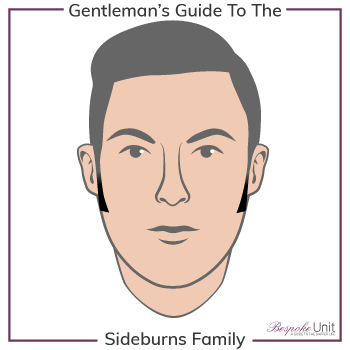 Once this is established, create a natural slope from the front of your Sideburns to seamlessly meet the axis. Although this can be achieved with clippers, scissors offer better precision. Comb or brush the hair in the desired direction. This can be either down if well-trimmed or to the sides if going for a Handlebar style. Using the scissors, trim away any stray or unwanted hairs. You can take away any hair that falls over the upper lip if you find this irritating. 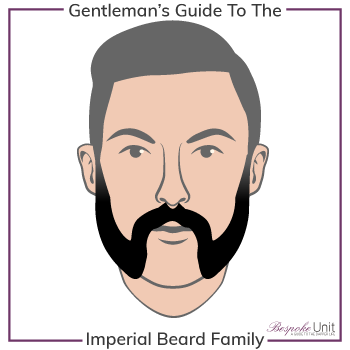 If you want to read a more detailed guide, head to our full moustaches guide here. 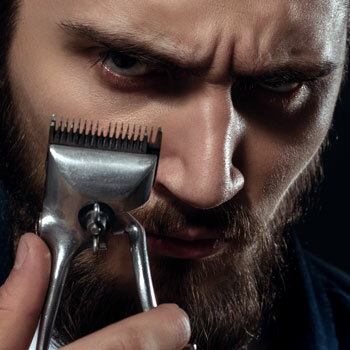 While you have the scissors on-hand, gently snip away at any stray hairs across the beard. Ensure that your its details are as you want them to be. Now that’s done, rince out your beard to get rid of any stray hairs and pad it dry. Apply an appropriate dose of beard oil and massage it into the hair and skin. This will keep the hairs nourished and provide some hold to your beard’s shape. Brush the hair back into place and check for any final strays. Finding the right beard oil or balm can be a confusing and frustrating endeavour. We have covered both in detail as well as their benefits and differences. You can either check out our full guide on beard oils or head to the beard balm page to learn more. 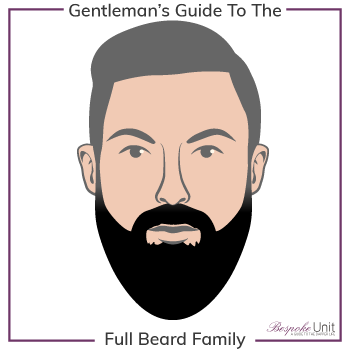 Now that you’re familiar with looking after and trimming your beard, you can read more about the individual families. You can find a full guide on each style via their respective images listed above. Finally, we’ve catalogued 7 individual face shapes. If you don’t yet know yours, we suggest that your identify your face shape before reading each style in detail. This is a great guide, thanks! I’ve got a patchy beard and I’ve been looking for a guide like this for a while! No worries, Ron. We’ll soon be expanding on how to improve patchy beard growth. But with so much to work on right now, please be patient and try the tips that we offer above! Thanks. A much needed insight into beards. I am into growing boxed beards since years now but never knew these intricacies and the science behind it. Your description and its explanation is simple and effective. Will surely use your tips the next time I trim/shape my beard. If you want a guide more specific to boxed beards, just head to its dedicated guide! Im a 26 year old trying to grow a full stubble, but seem to have 3 glaring patches, one on each cheek and one under the chin. I let my beard grow for about 8 weeks, but the patches are still visible with long wiry hair around these patches and I think it looks unkept. Because I’m trying to just grow it to a stubble, would it be a good idea to just trim the beard to the shorter length and wait for the patches to catch up? Or will this be a slower process than just let the hair grow for another couple months? I’m debating whether to pickup the trimmer or not. Please let me know your thoughts. Just letting it grow makes it easier to keep track of growth and comparing the patchy areas over time. However, if you do feel self-conscious, you can give it a light trim to even it out a bit.